Traveling business your business goes everywhere. Family owned and designed, made in the USA all bags are handmade. Throughout my years of being a business woman and working conventions and shows, I found I needed a simple way to advertise while simply walking around. These bags are custom made in the USA. They are industrial strength and double stitched with industrial thread. 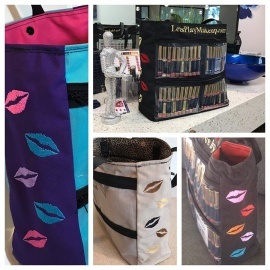 There are 4 window pockets on one side of the bag that will hold 10 lipsense each. The other side of the bag has one big window that will hold beauty books and paperwork. The inside has a velcro pocket that will will hold an iPad and 2 additional inside pockets. 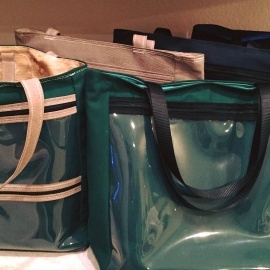 The top has two magnetic closures and the bottom of the bag has feet. Customization, includes outside and inside material choices. Additional, embroidery is offered e.g. website, email etc.